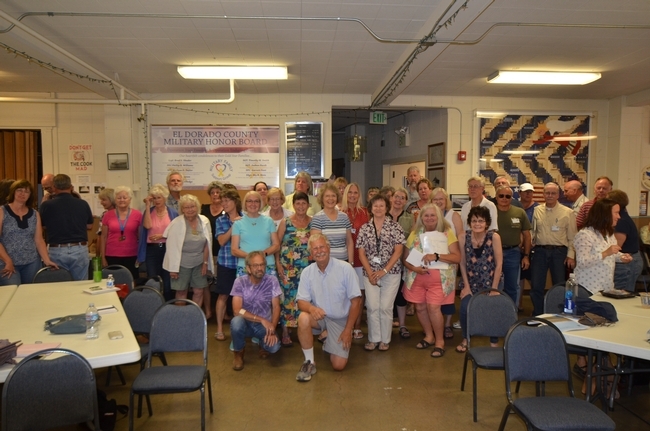 About 80 Master Gardeners of the UCCE group in El Dorado County came together to learn about the principles and practices of conservation agriculture in a lively discussion with CASI Workgroup Chair, Jeff Mitchell, on June 23rd at the group's monthly meeting in Placerville. The meeting was organized by Master Gardener event coordinator, Catherine Mone, and drew a very animated and engaged group of participants. Mitchell talked about the core principles of conservation agriculture and the extent to which they're now being used around the world and recently in California. He showcased examples of pioneering innovation that have been achieved in a number of cropping contexts and also provided information and ideas as to why it will be increasingly likely that these sorts of production system options may have greater receptivity and resonance in California in the future. He ended his discussion with some examples of motivation that he has benefited from over the years from his professional mentor, Dwayne Beck of South Dakota State University. "Take the E out of ET and the T out of can't," was Beck's encouragement to Mitchell. This can be accomplished by protecting the soil surface with crop residues that cool soil temperatures and reduce soil water evaporation, and by not giving in to merely accepting the status quo, but by identifying bold, ambitious, and long-term cropping system goals and then coming up with the ways to achieve them. This is, according to Beck, "Nothing short of the agronomic and ecological equivalent of the space race back in the 1960's" and we are going to need to really dedicate tremendous creativity and effort toward achieving it. CASI was very honored to be invited by the Master Gardeners of El Dorado County and we look forward to returning to Placerville in late September! Whether it’s called “high residue farming” or “conservation agriculture,” there’s very little of it currently done in California. For decades, the dominant production paradigm throughout California has been just the opposite - intense tillage, clean cultivation and residue-free fields. There is, however, growing interest in these sorts of crop production alternatives as evidenced by the lively and engaging discussions that took place as part of the recent three-day conference series, "New horizons for conservation cropping in California," March 9, 10 and 11 in Davis, Tulare and Five Points, respectively. The events brought three leaders in the development of high residue conservation tillage systems under irrigated conditions to California’s Central Valley to share their experiences and to propose possible applications of these cropping approaches for California farmers. Mike Petersen, precision tillage agronomist with Orthman Mfg. and former USDA Natural Resources Conservation Service Area soil conservationist for the 18 northeastern counties of Colorado, presented an extensive research base that he has helped develop demonstrating advantages of precise fertilizer placement at two depths below the seed, leading not only to increased early season root growth, but also grain yield for strip-till corn versus conventionally tilled corn. By only tilling in the areas of the field where seed is sown, typically about 30 percent or less of the total soil area, less than about two gallons of diesel fuel are used, little or no soil erosion occurs, and yield increases averaging 11 to 30 bushels per acre have been seed over an eight-year field comparison. Precision tillage and fertilizer placement that are readily afforded by strip-tillage planting systems would thus have considerable and multiple advantages that may have clear relevance for California producers. Since 2004, Andy McGuire, educator with Washington State University based in Moses Lake, Wash., has been working with Central Washington farmers to develop successful high residue systems for a variety of the region’s diverse irrigated crops. He has found that there tends to be typically no single factor motivating farmers to adopt high residue production techniques, but rather a suite of reasons that often combine to influence crop management decisions. Compared to conventional systems, high residue farming systems involve less overall tillage, diesel fuel use and labor, opportunities for double-cropping, and more free time, as well as reduced soil water evaporation. Essentially, all of the quite diverse crop production in this region of Washington relies on overhead center pivot irrigation, which McGuire pointed out is particularly well suited for high residue farming because furrows and beds do not need to be prepared to move water across a field as is done with surface irrigation. High residue cropping opportunities that Washington farmers are now using that may have relevance for California include edible dry beans strip-till planted into alfalfa, strip-till seeded onions into burned down wheat cover crop residue for wind protection, and even potato production systems that reduce wind erosion by preserving surface residues of prior crops. The progress and accomplishments of Dwayne Beck, the final presenter at the “New Horizons for Conservation Cropping in California” conferences, and the farmers in central South Dakota he has been working with since the 1980s are in many fundamental ways nothing short of phenomenal and transformative, and provided considerable “food for thought” for the California farmers, researchers, and consultants who participated in each of the three conference sessions. Beck is the South Dakota State University manager of the Dakota Lakes Research Farm, a farmer-owned research facility just outside the state’s capital of Pierre that has been no-till farmed since 1990. The no-till, high residue systems developed by Beck and his farmer colleagues have resulted in reduced soil water evaporation, far greater cropping diversification and intensification, considerably lower pesticide inputs, and increased net farm income throughout the region by over a billion dollars since the early 1990s. California’s Conservation Tillage and Cropping Systems Workgroup will present educational tours and programs at three locations in California March 9-11 to convey information on innovative conservation tillage crop production systems that are being developed in irrigated regions of South Dakota, Nebraska, Colorado and Washington. In addition to sharing information about the conservation cropping systems in these states, the speakers will discuss how the principles and practices can be implemented on California farms. 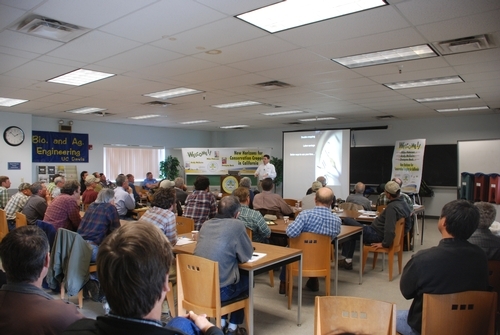 The first conference will be held March 9 at the UC Davis Western Center for Agricultural Equipment. The second meeting convenes on March 10 at the SCE Ag-TAC facility in Tulare and continues in the afternoon with tours of three Central Valley farms. The final session is March 11 at the UC West Side Research and Extension Center in Five Points. The presentations at the three locations will be the same. There is no registration fee and no pre-registration necessary. Dwayne Beck, manager of the Dakota Lakes Research Farm in Pierre, South Dakota. Beck has been inducted into South Dakota’s Hall of Fame for introducing cost-saving conservation tillage practices to the region’s agricultural industry when, in the early 1990s, farms were closing due to a lack of economic viability. Mike Peterson, retired USDA NRCS Conservationist and currently the California precision tillage specialist for Orthman Mfg. Throughout his career, Peterson has researched and developed information on strip-till approaches. Andy McGuire, cropping systems advisor with Washington State University in Moses Lake, Washington. McGuire has been working to evaluate and develop high-residue cropping systems for the irrigated crops of the Central Washington region. Conservation agriculture systems reduce overall tillage or soil disturbance, maintain surface residues, seek make production systems more efficient, and reduce costs. Speakers will address the integrated management of the conservation production systems. March 9, 12 noon to 4 p.m.: UC Davis Western Center for Agricultural Equipment, off Hutchison on Hills Drive, just west of 113. March 10, 8 a.m. to 1 p.m.: Southern California Edison AgTAC, 4175 S. Laspina St., Tulare, Calif.
March 11, 9 a.m. to 12 noon: UC Westside Research and Extension Center, 17252 W. Oakland Ave., Five Points, Calif.
For additional information on these conferences see the Conservation Tillage and Cropping Systems Workgroup website or contact Mitchell at mitchell@uckac.edu, (559) 646-6565.